Ziebart International Corporation is headquartered in Troy, Michigan, representing a global franchise network of vehicle appearance and protection services for over 53 years. The company was founded on rust protection in 1959 and currently operates 400 locations in 30 countries with over 800 processing centers worldwide. Ziebart is the world's leading name in automotive services that protect, preserve and enhance the appearance of cars and trucks. Ziebart offers superior proprietary products and services and a diverse business model. 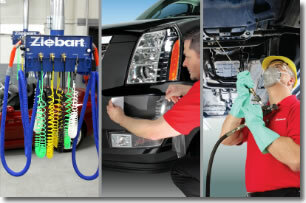 Specializing in professional automotive detailing, window tinting, paint protection films, fabric and rust protection, sprayed-on bed liners, glass repair, scratch repair and accessories, Ziebart is recognized as the No. 1 franchise in the automotive appearance services category by Entrepreneur magazine and is ranked #122 out of 200 of America's Top Global Franchises. For 2012, Ziebart ranked #153 in Entrepreneur's Franchise 500. Local Store Sales & Marketing Programs: Increase store traffic, grow sales, and build lasting relationships with customers. Our marketing staff is dedicated to assisting you in achieving your goals. Web Lead Generation Programs: Since 2009, we have generated over 90,000 leads for our U.S. dealers. Each lead is sent directly to your inbox and you are able to contact your new customers. Proprietary Products & Service Offerings in a Growing Industry that No One Else Has: Setting us apart from any automotive franchise out there, we've developed our own products and the processes by which they are used. Diversifying our offerings based on consumer demand brings a wide selection of proven profit drivers for your business. Military Friendly Program for Veterans: As a VetFran participant, Ziebart International Corporation will waive the $25,000 franchise fee for qualified applicants. Our Franchise is Operating in 30 Countries: Through partnership with a globally recognized brand that has been in business for 53 years, your business is trusted by the consumer market. Click on Request Information for FREE info on how to open a Ziebart franchise today! Please Note: This Ziebart franchise opportunity and other franchise business opportunities, businesses and franchises for sale on this web site are not to be considered as an "offering", "franchise offering", suggestion or recommendation by Franchise Leader™. This advertisement depends entirely on the truthfulness of the information provided by our advertisers which includes, but is not limited to, franchisers, franchise brokers, franchise consultants and business brokers. Franchise Leader™ recommends that you consult a lawyer, financial consultant, accountant or professional advisor before buying a franchise or business opportunity or any type of business. By using this form or any part of our website, you have agreed to all terms and conditions of Franchise Leader™. Please review our Terms & Conditions for more information.